THE DESTINIES OF TOM WOLFE AND JOHN GLENN have crossed again, almost 20 years after the publication of The Right Stuff, Wolfe's best-selling chronicle of the early years of American space flight. Wolfe has returned, after a long absence, to the hardcover-fiction shelves with A Man in Full, and Glenn has returned, after a far longer absence, to orbit. Both returns have been powered by 7 million-pounds of rocket-fueled hype, it's true, but these two have earned their victory rolls. 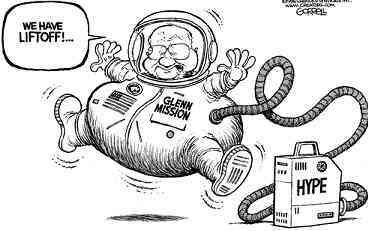 Yes, Glenn's flight was a triumph of symbolism over science, but -- reread The Right Stuff -- hoopla and heroism have coexisted in the space program from the start. For an aging American, a septuagenarian doing somersaults in space is just what the gerontologist ordered. Wolfe's new novel needs no qualification by reference to the author's age, although he himself is 69. "A Man in Full" brims with Wolfe's photo-realist detail, and it may be his most explicit lament yet for the decline of the older, heroic virtues, personified here by protagonist Charlie Croker --- a self-made, risk-taking, mightily over-leveraged real estate developer. Charlie's debts ($500 million to one bank alone!) confront him with a nasty dilemma: Gain relief from his creditors by participating in a political/public-relations charade that betrays both his friends and his own code of honor? Or stay true to himself, at the cost of his fortune and social standing? Charlie has conquered the world only to find that the world has left him behind. His old linebacker's body doesn't belong amid the decorator touches with which his fair-weather second wife has appointed their house in Atlanta's exclusive Buckhead. His cracker bonhomie comes off as gauche to the New South social elites aping the politically correct manners of their Yankee betters. And his warrior soul is an object of silent condescension (albeit tinged with awe) to the number-crunching M.B.A.s taking over the boardrooms. "A Man in Full" is entirely of its moment in its documentary details and many topical social themes. But it appraises contemporary mores, severely, in the long perspective of a 69-year-old man looking backward. Charlie's social-climbing and pretentious young second wife, Serena, doesn't measure up to his socially secure and self-sacrificing first wife. Charlie swells with ambition and joie de vivre; his disappointing son Wally is, by contrast, "a boy utterly world-weary by the age of sixteen, cynical, phlegmatic and apathetic around adults ... embarrassed by his advantages, desperate to hide them." It's easy to forget, but a mood of loss and corruption of an older, more pure code of values also haunted The Right Stuff. The "right stuff" was the elite ethos of an exclusive fraternity of test pilots, molded to the special pressures and demands of their dangerous vocation. As test pilots became astronauts, these small-unit values were tainted. The purest embodiment of the right stuff was Chuck Yeager, not John Glenn. Wolfe's Glenn was a true combat hero in World War II and Korea, and possessor (in spades) of the right stuff -- but in a combination adulterated by the image-conscious apple-polishing of the personality ethic. He was more media-friendly and bureaucracy-savvy than the unsung pilots of Edwards Air Force Base who broke the sound barrier. He was an enthusiastic test subject for the Mercury program's aero-medical experiments on the effects of weightlessness on the central nervous system (some things never change! ), while truer representatives of the breed resented being reduced to "lab rabbits with wires up the tail and everywhere else." The straight-laced "Deacon Glenn" frowned on the drinking and joyriding and skirt-chasing, the cathartic "regrouping" that fighter jocks who lived in the shadow of death allowed themselves in order to "maintain an even strain." The allegiances of the insular test pilot fraternity were to their shared vocation, and to each other. Glenn recognized a competing loyalty -- to the expectations of the Mercury 7 astronauts' adoring new public. And he more than anyone built those expectations. Glenn, wrote Wolfe, painted an "amazing picture of the Perfect Pilot wrapped up in a cocoon of Home and Hearth and God and Flag," and henceforth the astronauts "would be served up inside the biggest slice of Mom's Pie you could imagine." In Glenn, the rough-cut warrior spirit that Wolfe named the Right Stuff was carved into a marble idol suitable for public worship. Of course, it takes both the spirit and the salesmanship to make an icon, and John Glenn has proved again why he is one of our greatest icons. And Tom Wolfe has proved once again why he is one of our greatest iconoclasts.